Follow link for presentation on: Detailed RCJLT Flow. Monolithic 3D IC technology is applied to producing monolithically stacked low leakage Recessed Channel Junction-Less Transistors (RC-JLTs). Superior contact resistance is achieved with the heavier doped top layer. The RCAT style transistor structure provides ultra-low leakage. 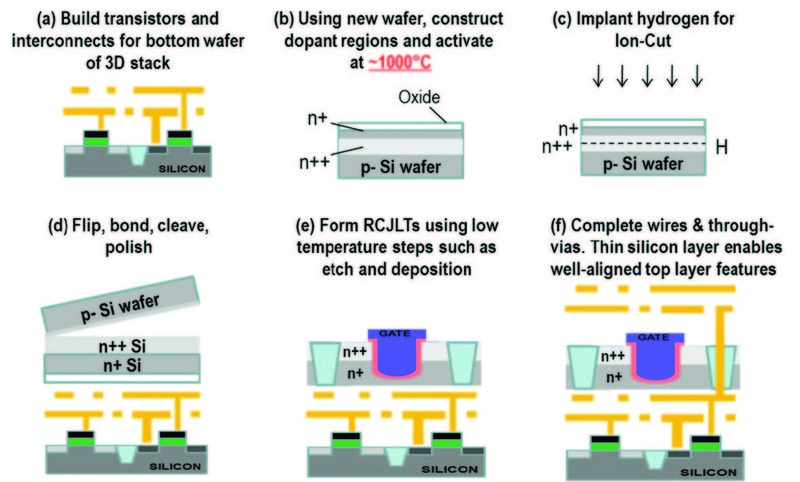 Create a layer of Recessed Channel Junction-Less Transistors (RC-JLTs), a junction-less version of the RCAT used in DRAMs, by activating dopants at ~1000C before wafer bonding to the CMOS substrate and cleaving, thereby leaving a very thin doped stack layer from which transistors are completed, utilizing less than 400C etch and deposition processes.